An ancient forest at the end of the world is facing an unprecedented threat. 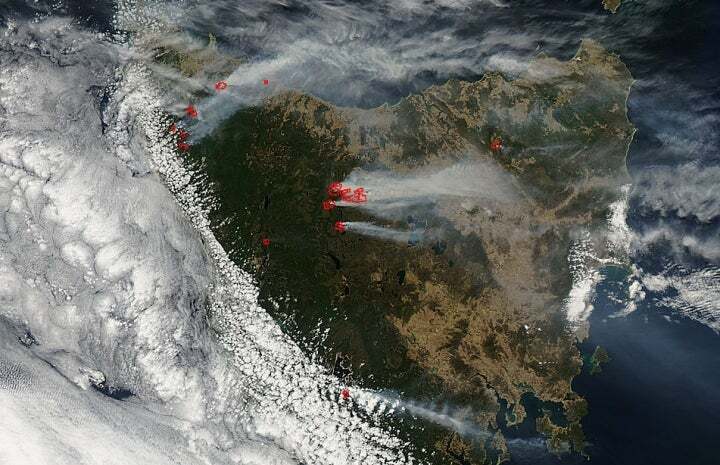 Since mid-January, bushfires sparked by lightning storms have raged across northwest Tasmania, home to relic forests dating back to when the island was part of the Gondwana supercontinent 180 million years ago. Over 250,000 acres of forest have been scorched by the bushfires, including parts of Tasmania’s Wilderness World Heritage Area. And there’s no clear end in sight. As David Bowman, an ecologist at the University of Tasmania told The Guardian, the forests might continue to burn for up to three weeks, fuelled by a high pressure system bringing sustained warm, dry conditions. Many are questioning whether the Tasmanian fire service has the resources to fight the fierce, remote blazes. This isn’t normal. While fire seasons are a regular part of life in dry, scrubby southwestern Australia, the same isn’t true of the lush, wet forests of northern Tasmania, more akin to those in the Pacific Northwest. But a particularly dry year, which experts are now suspecting could have been brought on by climate change, has turned many regions into a tinderbox. Flames are not only licking 1,000 year-old trees, they’re burning through the deep, carbon rich peat that’s been accumulating on the forest floor for millennia. Peat fires are particularly difficult to put out, and they pose an added risk to the forest, burning through the natural seed bank that would allow new trees to sprout next year. Already, local ecologists are calling for efforts to collect seeds of the most fire-prone species for storage in safe locations. While only a small fraction of the World Heritage Forest has burned, it’s possible that this devastating fire season is a harbinger of the future. And if that’s the case, we need to start preparing.